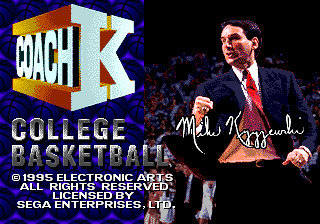 Coach K College Basketball is a 1995 basketball game for the Sega Mega Drive by Electronic Arts released exclusively in the US. The game has a focus on American college/university basketball teams. Main article: Coach K College Basketball/Magazine articles.